In the dashcam video (after the jump) which was captured by a second officer at the scene, Anthony Promvongsa (who was 21 at the time of the incident) is seen in the driver’s seat of his parked vehicle when Buffalo Ridge Drug Task Force Agent Joe Joswiak (who was off-duty at the time of the incident) approaches the car door with his gun drawn. Joswiak is heard profanely ordering Promvongsa to exit the vehicle. Immediately upon reaching the car door, Joswiak flings it open and begins forcibly pulling Promvongsa from the vehicle. Joswiak appears to knee and punch Promvongsa several times as he forces him to the pavement and handcuffs him. Midway through the video, another uniformed officer — Sgt. Tim Gaul — is also seen inexplicably turning off the audio of the recording dashcam, leaving no record of the verbal exchange between the police and Promvongsa for the remainder of the arrest. Now, Promvongsa is facing several criminal charges stemming from the traffic stop while Joswiak does not appear to have any sanction for his obvious use of excessive force. The incident took place on July 28, 2016 — just three weeks after Philando Castile was shot and killed in St. Anthony, Minnesota last year by a police officer during a routine traffic stop. 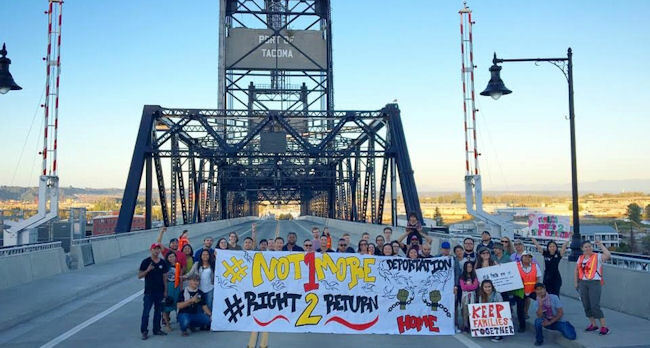 Last week, war veterans, mothers, fathers, family, friends, and children held signs of pleas to stop deportations of their loved ones. Organized by family members of those detained, and supported by a coalition of API advocacy organizations, people lined the streets of Minneapolis outside Senator Amy Klobuchar’s office to demand justice after almost a dozen Cambodian Minnesotans were detained for deportation. This isn’t solely in the Cambodian community. Just last year, the story of Lao American DJ Teace aka Thisaphone Sothiphakhak was in the Minneapolis City Pages. Sao Lue Vang, 64, was severely beaten by Kevin Elberg on November 5th after a trespassing dispute. Vang’s family are questioning if racial bias may have contributed to the attack. Three weeks ago, 64-year-old Sao Lue Vang was out hunting with two friends in Pepin County, Wisconsin. It was a hobby that Vang had participated in for twenty years. He was familiar with the local public land, and with the etiquette of the local hunting community. According to Sao [Lue Vang], Elberg started harassing, yelling, and accusing Sao for being on his property. Although Sao’s english speaking abilities are limited, he was able to understand what Elberg was saying. He politely apologized to Elberg for the misunderstanding. To which Elberg replied, “I don’t care”. The confrontation escalated. Fearing that Elberg would harm him, Sao radioed his hunting party and proceeded to walk away from Elberg. Sao is 5’3, 117 lbs. Elberg appeared to be in his early 40’s, over 6 feet tall and weigh around 180 lbs. (The Leader Telegram newspaper later confirmed that Elberg had military background). Suddenly, from behind, Elberg struck Sao with enough force to knock him onto the ground. Elberg wrestled Sao for his walkie talkie while Sao continued to cry out for help. 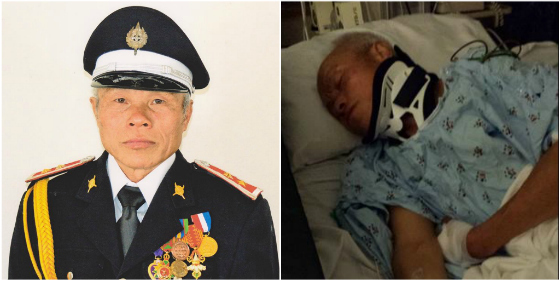 While on the ground and helpless, Sao was kicked and struck several more times in the stomach and body. Elberg then grabbed Sao’s rifle and struck him with it, causing lacerations and bleeding to his left hand. Sao pleaded for his life and continued to yell for help. Elberg put his hands over Sao’s mouth, causing him to gasp for air. Shortly after, Sao was unable to breathe and became unconscious. Elberg was arrested on November 8th and released without bond, pending possible criminal charges. Meanwhile, Vang’s family are now speaking out, accusing Elberg of racial bias in this horrific assault (video after the jump).